Storm drains and spouting are subject to getting clogged with debris. From leaves to tennis balls, a buildup or clogged storm drain can cause your spouting to work improperly and inefficiently. 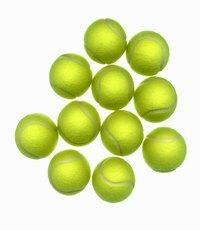 Removing tennis balls from spouts and drainage tubes involves using objects to help you reach the impasse. Determine where the tennis ball is lodged by shining a flashlight down the spout. The light will reflect off of the fluorescent surface of the ball. If you cannot visually locate the ball, run a steady stream of water down each spout to determine where the lodged ball is located. Remove the bottom portion of the drain spout, especially the curved end piece which is where the tennis ball, once dislodged, will get stuck. Connect all attachments to a shop vac to create the longest hose possible. Insert the hose directly in to the spout where the tennis ball is. Turn on the shop vac and suction out the tennis ball. Try sucking up the tennis ball by entering the drain spout from both the top and the bottom. Use a pressure washer to dislodge a tennis ball which cannot be removed with a shop vac. Use a plumber's snake to first loosen the tennis ball and to ensure the ball can be moved. Turn on the machine to the lowest setting to start and increase pressure until the ball falls out of the bottom of the drain spout. Make sure to work with the lowest pressure setting on a pressure washer to start to help prevent damaging down spouts. If you cannot remove a lodged tennis ball, consider calling a spouting or siding expert to help remove the clog so as not to damage costly spouting.